I just love tea, and I think that Toronto can’t have enough tea. That’s why I was happy to discover Pluck Tea! They put a lot of thought and care into their beautiful teas. Pluck sources their tea from “the top 10% of premium tea leaves from sustainably-managed gardens and certified organic sources from around the world”. If that wasn’t awesome enough, here’s the best part. They add unique local ingredients to their blends, like grape skins from Niagara on the Lake and even local bee pollen! Floral and grassy, with a hint of ginger. Prince Edward County lavender features in this tea, which is delicious hot, or served over ice with a lemon wedge. A fruit – forward lychee blend featuring the flavours of Toronto’s Chinatown. Mango, Lime, Lemongrass and Coconut intertwine. A fantastic iced tea. An international infusion of holy basil, citrus, ginger, cardamom, and pink peppercorns. Bright, spicy, and uplifting with an incredibly refreshing aroma. Includes local bee pollen from Toronto Beekeepers! In addition to creating unique teas, Pluck donates a portion of profits to The Stop, a very worthy organization. If you’re looking for an extra special gift, you can meet with their Tea Sommelier in their private tasting room and whip up a bespoke blend. Doesn’t that sound amazing? To see a list of all of their teas, please click here. I’m looking forward to trying Vanilla Rose next! 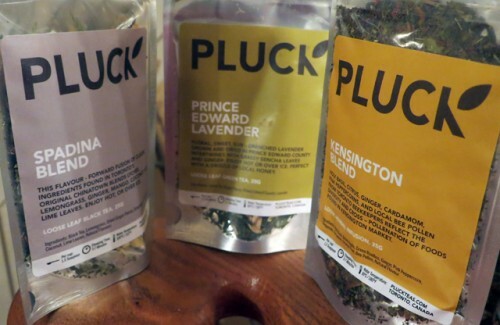 Pluck Tea is sold at McEwan and online. « It’s time for SpaWeek!